Our pool is currently undergoing maintenance. We apologize for the inconvenience. 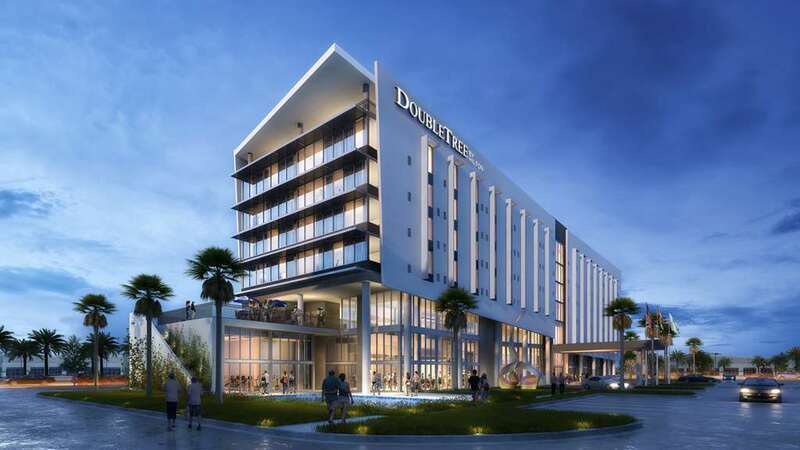 Your modern and vibrant DoubleTree by Hilton Miami Doral FL is located in the heart of Dorals* bustling business district. Featuring local photos of Miami that embraces the culture and area your full-service DoubleTree by Hilton Miami Doral FL was designed with all of the modern comforts that today*s traveler expects. This brand new hotel is just nine miles from Miami International Airport two miles from Dolphin Mall and within walking distance from Miami International Mall. Downtown Miami South Beach the Art Deco District and Lincoln Road are all within easy reach. Our hotel offers a local shuttle within a five mile radius. We*ll greet you at check-in with a warm DoubleTree Chocolate Chip Cookie. Feel at home in a guest room with complimentary WiFi satellite TV a mini-fridge ergonomic workspace and plenty of outlets to charge your devices. Our suites offer a separate living area larger bathroom and second TV. A wealth of amenities await you including a state-of-the-art fitness center outdoor pool and terrace with bar. Dine at Rocio with its creative cuisine for all taste buds or enjoy your favorite beer or cocktail Antojitos Lounge. Grab a snack sandwich and other fresh selections at Made Market. Our hotel features meeting space for any special event or conference and can accommodate up to 275 people. Rocio Restaurant is the on site restaurant at the DoubleTree Miami Doral. The Restaurant consists of a diverse menu that fits every pallet. The restaurant also provides a daily room service menu served from 600am to 1100pm daily.